The use of hand signals by operators of overhead cranes is crucial to safe operations, particularly on busy job sites. 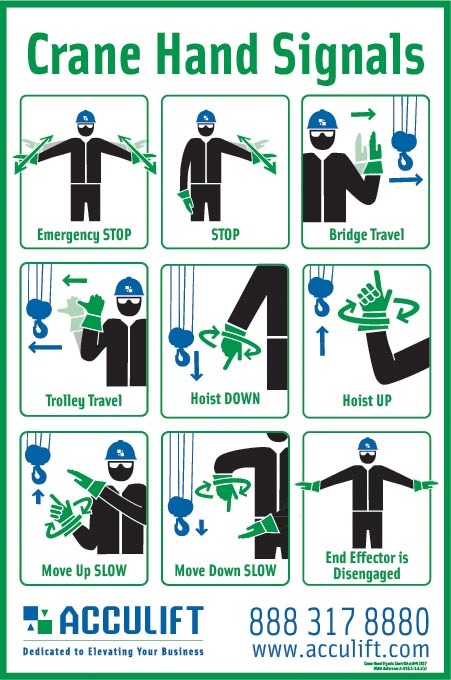 Provincial guidelines require that crane operators and signal personnel must know the hand signals used to direct the operations of the crane and that a poster explaining those hand signals be in a visible location to the operator. The poster must be posted near the crane as a reminder to the operators. Work sites can have additional hand signals of their own but they cannot conflict with the agreed upon standard hand signals for operations. Qualified and trained signal persons must be present before the lift. Only one person should be giving signals to the crane operator unless it is an emergency stop situation – anyone can give the emergency stop signal to the crane operator. Before operating the crane the operator must be aware of who is the designated signal person. On double crane systems, a system of identifying which crane is to be used should be agreed upon before operations commence. Back Up: Three short audible signals. Download our crane signal poster here for your job site. As part of our complete S.I.T.E. 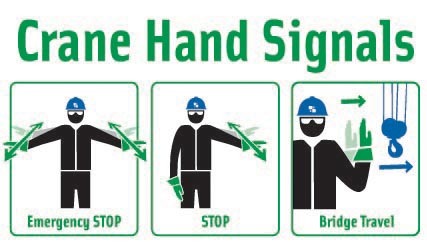 Program, Acculift provides posters of crane hand signals for your work site when you book an inspection with us. Proper training is crucial to proper equipment operation. Contact us, we will arrange certified crane operator training of your staff, either in a classroom or on your job site.